Preterm birth is the leading cause of mortality in newborn infants and can lead to significant neonatal morbidities. Spontaneous preterm birth accounts for at least 50.0% of all preterm births. We argue that chronic maternal stress load, which is an important risk factor for spontaneous preterm birth, could be represented by epigenetic signature of several specific genetic loci in the mother’s blood. A literature search was done in PubMed with the following keywords: “DNA methylation,” “epigenetics,” “maternal stress” and “preterm birth” from year 2000 to 2017. We suggest that these genetic loci might be related to vulnerability and hypersensibility of stress response during pregnancy in women with preterm births. The mother’s epi-genetic stress bioprofile was supposed to be a result of chronic maternal stress load since her birth. 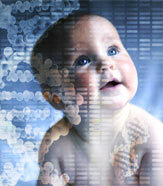 This epigenetic bioprofile might also be a potential biomarker for spontaneous preterm birth. DNA methylation changes are tissue-specific and human stress response manifests mostly through the central nervous system (CNS). Nevertheless, we found evidence that methylation changes of DNA isolated from blood leucocytes might be a reliable measure of stress-related epigenetic changes that occur in the CNS. Evaluating biological mechanisms through the development of simple assays based on epigenetic changes to measure chronic stress loads in expectant mothers can lead to our ability to prepare more effective measures for the prevention of preterm births, as well as leading to more effective treatment strategies for both expectant mothers and their newborns.